Scarlet Seven is a fully custom touring bicycle assembled by Ride Studio, Lexington MA. Scarlet was born on 27 September 2015. Scarlet has a Seven Cycles titanium Expat SL frame and a steel Waterford Uni-fork. Scarlet has Shimano Ultegra hydraulic disc brakes and Di2 gear shifting with 36:46 chain rings and 11:32 cassette. Scarlet also has a Schmidt SON Deluxe SL Disc dynamo electric hub, a Schmidt Edelux II headlight and Busch & Muller Toplight Line Plus taillight. Scarlet has a Tubus Tara front rack and a Tubus Cosmo rear rack on which Ortieb Front-Roller Classic and Back-Roller Classic panniers ride. Scarlet is a great bike for touring. In July 2016, Scarlet moved to Seattle WA. 20160806. 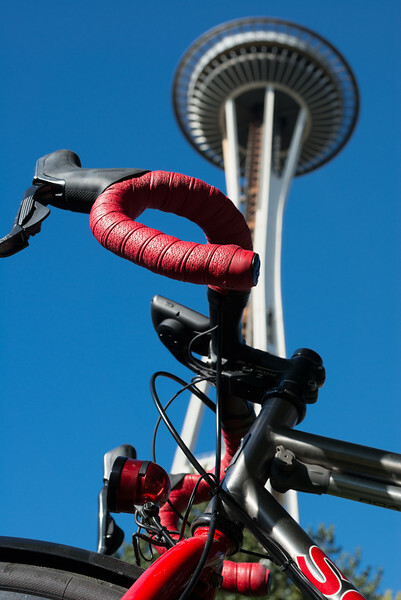 Scarlet Seven and Space Needle, Seattle WA.